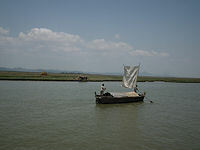 Our boat left Sittwe jetty cruising along the canal. At both sides the banks were full of daily life activities. Small wooden boats were delivering daily stock or local people being ferried to other villages. At the end of the canal our boat turned left into the very large delta of the Kaladan River looking the size of a large lake. The journey to Mrauk U takes about 5 to 6 hours, a most pleasant and relaxing trip, the seascape of fishing boats & local sailing boats gradually giving way, as the river narrowed, to landscapes along the banks of rice fields, sugar cane, straw-thatched huts, bamboo rafts & water buffalo. We arrived at Mrauk U boat jetty set among shacks & coconut trees. This is the best rural jetty setting that I have ever come across. This is even more rural than Sittwe. We checked in at Shwe Thazin hotel. This is the sister hotel of the Shwe Thazin in Sittwe but is a higher standard. The hotel décor & presentation is better, the room is better in each detached or semi-detached bungalow, the hotel environment is better with a lovely garden theme & the restaurant food is better & tastier. The hotel staff are friendlier & extremely helpful. Every time our car drove up to the front door our room key was handed over to us by the waiting staff as soon as we were out of the car door. A security guide would bow & greet us every time we departed or arrived back to the hotel. The whole experience of staying at Shwe Thazin hotel in Mrauk U was very welcoming. This afternoon we visited the North group of temples in Mrauk U. First we visited the Shittaung Paya. This is the most complex temple consisting of an outer temple & inner temple. First we arrived by walking up a flght of steps leading to the entrance of the temple. As is the custom all shoes & socks must be removed to walk with bare feet into the temple & also its surrounding areas. The first impact was the hundreds of different sized Buddha images all around the walls. Inside the temple there are several doors leading to a labyrinth of passageways eventually leading to a large Buddha image in the central hall. 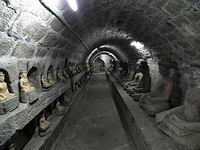 These tunnel-like passages are lined with clay Buddha images on one side & small gold Buddha images on the other. 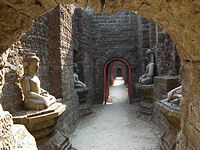 The tunnels gradually enlarge into walkways with carved reliefs of animals on the wall - these are the animals that Buddha was reincarnated into, for example one life as a horse, two lives as a dragon & five lives as a pig. From there we stepped outside. The afternoon sun was still very strong from the West onto the ground & the temple courtyard. This is where I experienced the first burning of my bare feet. We walked along a row of stupas & turned to the open ground looking out to more stupas & temples across the fields in the distance. This reminded me of the views of the temples in Bagan, except it is greener here in Mrauk U. We walked down still in our bare feet to see more temples on the ground. It is not just the heat on the ground but the small stones too that caused difficulty. Our guide & other local people have no such problems. We saw more Buddha images inside more temples & stupas. It is a relief to walk inside as it is cooler & darker inside the temples. As the late afternoon sun began to set local people were gathering round a large pond with steps to walk down to get their water. Others are bathing & washing there too. 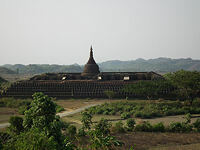 Next morning we drove over an hour out of Mrauk U to visit the Mahamuni Paya. The Buddha image is one of the country's most famous. There is a wonderful image of lines of monks walking up the hill behind the standing Buddha. Inside the temple there are many worshippers praying & buying gold leaf to put on the beautiful golden Buddha image shining on the altar. We drove back an hour or so through the lovely countryside views of green fields & water buffalos. We arrived back to Mrauk U & inspected the only luxury hotel in the area, the Mrauk U Princess hotel. This is the same chain of Princess hotels as in Inle Lake. The hotel is set in a beautiful garden with pond & the hotel’s own pier at the end of the pond & garden for hotel guests arriving by the river. We saw it from our boat just before arriving in Mrauk U. 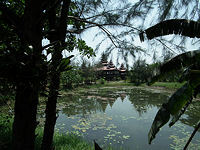 All the rooms are in local style wooden villas & bungalows among the green & lush gardens. The best feature of the hotel are the 2 sitting areas on the decking with the views of the ponds & the river beyond. After lunch we visited the East group of temples. First we visited the largest & most interesting Koe Thaung Temple. This is a large outdoor temple complex with lots of walking around in our bare feet under the hot afternoon sun & the roasting ground. The sight of the temples is still worth getting my feet burned. I was on tiptoe causing some surprise from the local people. The entrance to the temple is lined by 5 rows of hundreds of stupas on both sides. Behind these stupas there are passageways entering the temple. The passageway are lined with thousands of bas reliefs on the wall & Buddha images all along the walkway. There are also hundreds of small Buddha images running along the fallen walls on different levels. We walked through the pile of fallen rock, broken stone & statues along the dry & dusty soil. It was fascinating to see all these seated figures along the walls row after row. One could imagine what it must have been like when it was first built in 1553. Afterwards we visited the small Peisi Daung Paya on the hill. From here you can see the full view of The Koe Thaung Temple from a distance. We also visited other temples & the Laksaykan Lake. The lake has no significant interest but the nearby green fields is very calming & refreshing to look at. There are animals grazing the fields, men & women carrying their clothing after washing in the lake. It is this ordinary local daily country life that is so overwhelmingly attractive to us. There is another possible trip to visit a Chin village by boat but we were unable to do it as we were leaving Mrauk U tomorrow in the early morning. The day trip to the Chin village requires about 2-3 hours by boat each way. Our guide told us that the river boat journey is very nice with lovely country views & greenery all the way but there are no historic temples for interest except the local villages. These villages are very poor & are very welcoming to any visitors who come to their villages. There are markets on Tuesday & Saturday in some villages. 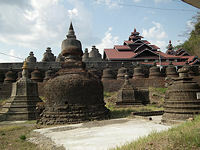 We can offer this trip but it requires three nights in Mrauk U.